I introduce to you, The Rundown Report! Welcome to the first in a new series of blog posts. Each week we’ll be searching the web for the latest news from around the world of online marketing and social media and feeding it right back to you in one easy to digest report, available to you every Friday afternoon. It won’t all be serious though – we’ll make sure you’re kept up-to-date with the best news and images from the lighter side of the web. So, without further ado, let’s kick off! Responsive email: Avoid defections by improving mobile experiences | Mobile opens are on the rise. Marketing Land look at how a poor mobile experience can ultimately effect your sales. 7 tips to make your email marketing more mobile friendly | Following on with the responsive email theme, Entrepreneur look at how your email marketing can be improved for mobile users. Changes at Spamcop | Spamcop, a group whose soul purpose is to stop spam, is seeing some changes. Word to the Wise investigates what this means for email marketing. 10 of the most shared brands on Instagram video | As the use of Instagram video increases, Econsultancy look at the big players when it comes sharing activity. Twitter plays catch-up on the visual web | This week saw the introduction of image previews in tweets on Twitter. ReadWrite look in to why Twitter has gone visual. Five ways to maximise your social media ROI | Making sure you’re getting the best ROI from your marketing efforts is important. Boomerang look at how ROI can be increased across your social networks. Code Computerlove designs new HMV website | HMV have been going through some tough times. Can a website re-fresh help them recover? Design Week investigates. 25+ tried and tested tips for building your personal brand | Trying to build your brand? These tips from Econsultancy should really help you out. Samsung fined $340,000 for faking online comments | Samsung take marketing to a new level by posting negative comments about competitors across the Internet. The Verge look at the facts. If Halloween didn’t freak you out enough, here’s something that might. Take a look at HERE IS TODAY, a website that’ll make you feel really insignificant. Marketing done right! 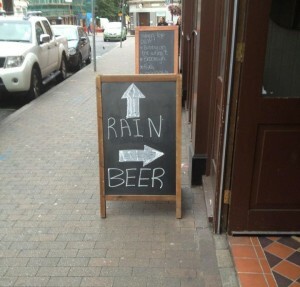 Staying safe during the great storm… this seems like the best and most logical option. That’s all for now, folks. Have a great weekend, and make sure you check out next week’s Rundown Report for more news from around the marketing world. Got any ideas of things we should feature next week? Email your suggestions to me at ollie@sign-up.to!